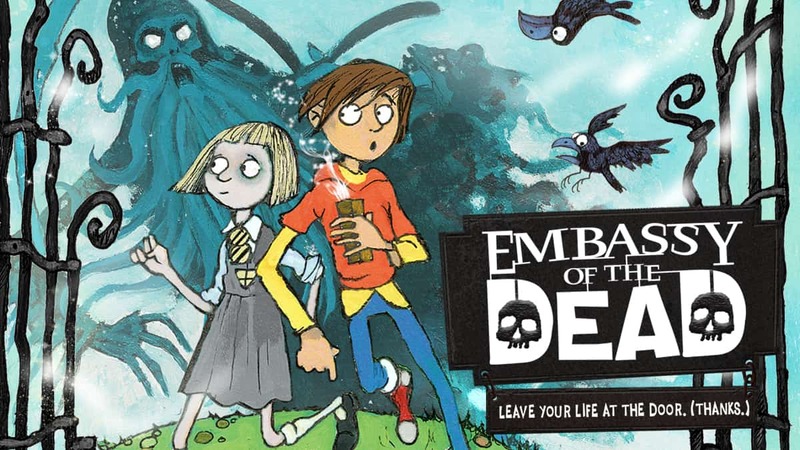 Introducing Embassy of the Dead, the brand new book from Will Mabbitt! Warning: talking to strange ghosts in a dark alley is a really bad idea! If you love Skulduggery Pleasant and Who Let the Gods Out by Maz Evans, you’re going to love this! Embassy of the Dead is the first book in a spooky new series, where the living meets the dead and survival is a race against time! When Jake opens a strange box containing a severed finger, he accidentally summons a grim reaper to drag him to the Eternal Void. Yep, it’s as fatal as it sounds. Now Jake’s running for his life but luckily he isn’t alone… he can see and speak to ghosts! Jake’s hanging around with his deadly gang who all have one mission, to find the Embassy of the Dead and to seek protection! There’s Stiffkey the undertaker, hockey stick-wielding Cora, and Zorro the ghost fox.